In this follow up to the hit What the Dinosaurs Did Last Night, the masterminds behind the social media phenomenon Dinovember once again envision the wonder and chaos of toy dinosaurs come to life-this time in a setting that's perfect for back-to-school! Every November, writer and social media master Refe Tuma and his wife, Susan, work into the night to bring their four children scenes from the secret lives of their toys--specifically the nighttime antics of their plastic dinosaurs. But in the follow-up to the hit What the Dinosaurs Did Last Night, these scampish dinosaurs make the trip to school, hidden in a kid's backpack. 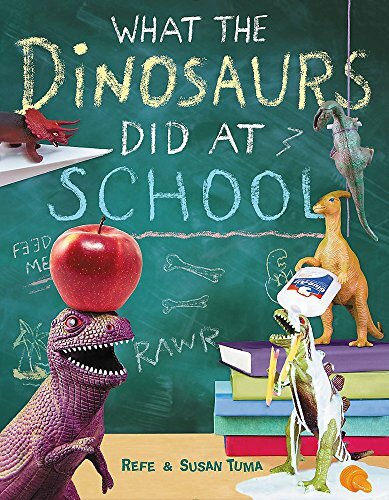 Each scene is photographed in meticulous detail, letting viewers joyfully suspend disbelief and think to themselves--just LOOK at what these diminutive dinos did at school! If you have any questions about this product by LBYR, contact us by completing and submitting the form below. If you are looking for a specif part number, please include it with your message.